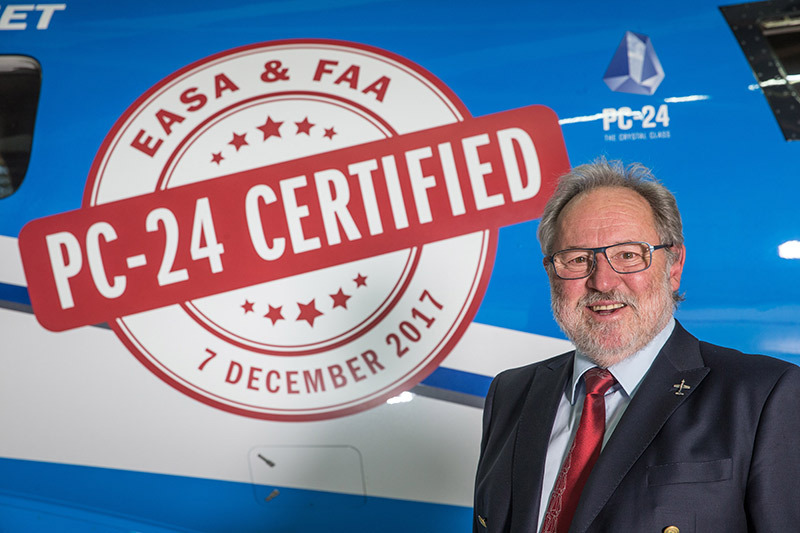 On 7 December 2017 Pilatus obtained type certificates from the European Aviation Safety Agency (EASA) and the US-American Federal Aviation Administration (FAA) for the first ever Swiss business jet. 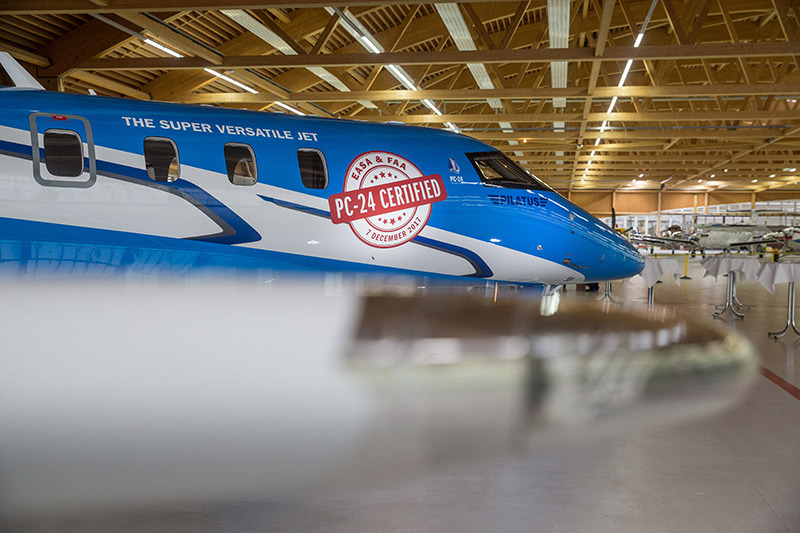 Certification of the Super Versatile Jet prepares the ground for initial customer deliveries, which will see the PC-24 business jet take off from Central Switzerland for its entry on the global market. 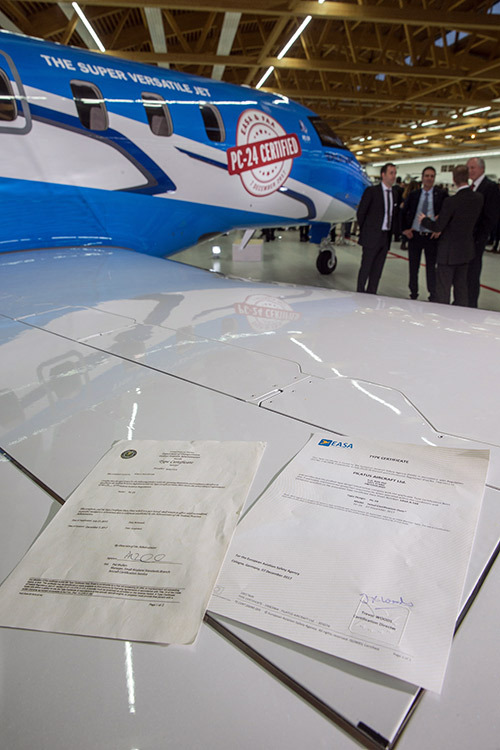 In any project to develop a new aircraft, certification by the aviation authorities is by far the most important milestone, given that it means deliveries to customers may go ahead, generating revenue for the manufacturer. The PC-24 development project was officially announced in 2013, but work on the Super Versatile Jet has in fact been in progress for the past eleven and a half years. The first PC-24 prototype completed its maiden flight in May 2015. All three prototypes used in the certification programme have flown a total of 2205 hours worldwide so far. Some flight tests were conducted in extreme environments: in icing conditions and very hot temperatures, at altitudes and speeds not usually encountered in everyday operations. Other tests have included bird impacts, structural stress tests, noise tests and general function. All this to prove that customers may depend on this aircraft to operate safely and reliably at all times, in line with statutory requirements. In fact, Pilatus test pilots took the aircraft to the very boundaries of its limits and even beyond, flying it in configurations and maneuvers forbidden to the commercial pilots who will subsequently occupy the cockpit. This entry was posted on Monday, December 11th, 2017 at 12:51 pm. Both comments and pings are currently closed.